If you and your family are anything like me and mine, Thanksgiving means two things: food and football. While it's fun to dress up for the holidays, we also get really, really into our teams, so it's only natural throughout the years I've found a healthy balance of sporty and fashionable. This is without a doubt one of my favorite outfits of all time. 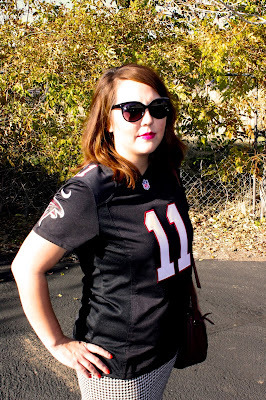 Even taking out the jersey I'd replace it with a tee shirt and it would be the perfect mix of casual and chic. I love this fun skirt with this jersey (yes, it's a Raiders jersey for the hubs!) and to make it even more perfect for the holidays, the waist band is super stretchy so I can go back for my customary seconds. It's all about the little details, am I right? These J. Crew pants are, again, super comfy and they matched perfectly with my Wilson jersey. I threw on a bright cardigan, comfy flats, and a statement necklace. 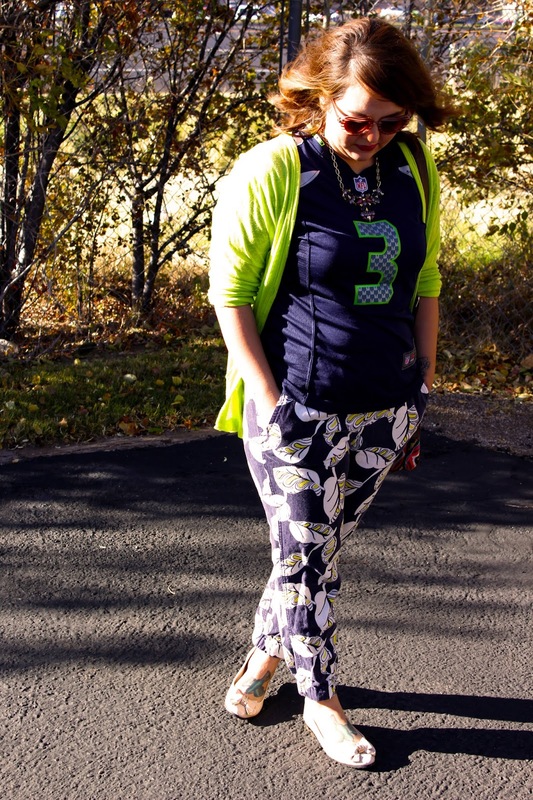 The pants make this outfit a little more dressed up but this could definitely be worn out to a game or even to a Superbowl party. I am a firm believer that a pencil skirt dresses up any outfit and this black and white checked one worked perfectly with my Julio Jones jersey (yep, love Atlanta too!). I added a pop of red with the shoes and if you guessed the skirt was super stretchy and comfortable then you know me all too well. It's fun to get dolled up for the holidays but I am all about tradition and I enjoy incorporating my love of football into my holiday outfits. What do you wear to Thanksgiving? Are you a dress up or dress down family? 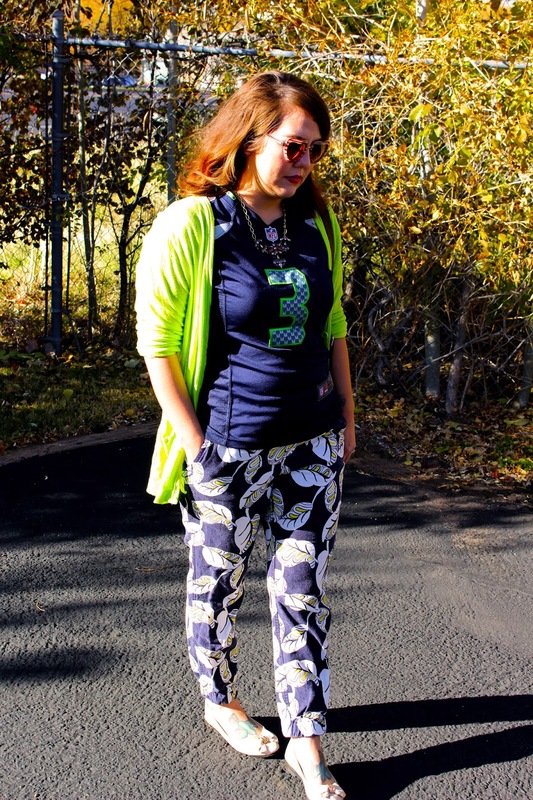 You know being a football, fashion and food fan myself, I am so in love with all of these Kim! Cute cute cute and oh so fun! 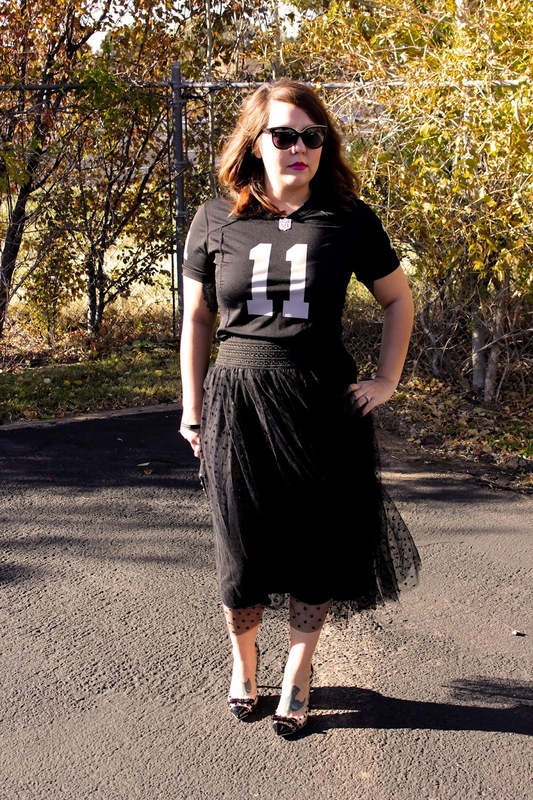 I do believe the first one is my favorite just because of that adorable and flirty skirt! You look cute as can be and for me I would wear any of these to Thanksgiving dinner! Happy Tuesday you adorable sweetie pie!! It's crazy how fashionable all of these outfits look with the jersey. I of course am biased to the Pats, but yours looks great too! I especially love the first skirt! I have missed you and yay - I love these looks so much!! Love it how you mixed up elegance and sport, and you pull it off so well, hon. I love these outfits Kim, you look absolutely beautiful have a lovely Thanksgiving my wonderful friend! Kimmmm !!!! That first black skirt is gorgeous !! I love the vintage feel and how it somehow works perfectly with your team top hehe :) My favourite outfit out of these three has to be the middle one I just like how your dressed up and down at the same time and I think that the outfit really suits you, you look brilliant :) I'm definitely a dress up sort of girl ! I'll never miss the chance to dress up in a cute vintage dress and twirl around hehe ! These are all amazing looks! I can't decide which outfit I like best, although the skirt in the first look is so fun! 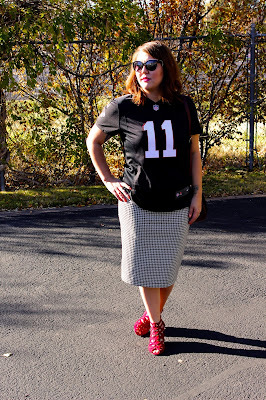 I really like how you made the jersey look so fashionable and chic. I usually get a little dressed up for Thanksgiving, although I'm not sure what I am going to wear this year!